Before I go through Kefir, let’s have a quick understanding of gluten- and lactose- intolerance. Also known as celiac disease occurs when your immune system attacks your intestinal cells in response to gluten in your gut. Gluten consists of a set of protein in wheat, barley and rye that elicits this autoimmune disorder. Symptoms include abdominal distress, headaches, fatigue, and tingling in your hands and feet. Absolute gluten intolerance can result in malnutrition, osteoporosis, infertility and digestive-tract cancers. A negative reaction to lactose or to milk proteins is caused by your lack sufficient lactase, which breaks down lactose in your gut. Symptoms include abdominal cramps, bloating, gas and diarrhea after consuming milk products. On the other hand, a milk protein allergy is an autoimmune disorder that can result in digestive upset, skin rash, breathing problems, and life-threatening anaphylaxis in severe cases. So why I’m talking about gluten- and dairy- intolerance? because I have developed those symptoms myself over the last few years. I’m not sure how it happened since I thought food allergies normally appear in early childhood. When I visited a doctor in South Korea, he couldn’t explain exactly but told me about this Korean girl who also had same symptoms since she moved to America in her 20s. I could be wrong, but my theory is changing diet and lifestyle in another country can distress your system and cause negative reactions to certain foods. The health of our bodies is determined by the health of our gut. A balance of good and bad bacteria in your gut breaks down foods, stimulates immune system and inhibits pathogens. For sufferers like me, a healthy diet is crucial to maintain your gut health including taking probiotics and consuming probiotic foods and drinks. I have tried to take probiotics like Inner Health Plus for a few months, but didn’t feel that much difference. What works for me is fermented products! Fermented products break down sugars to more digestible, help control harmful bacteria in the body, fight diarrhea, help with indigestion, fight chronic inflammation and boost immune system function. You should be wondering by now, then what are the fermented foods? Kefir is the fermented milk drink made from the kefir grains. Kefir colonises our digestive tracts with beneficial bacteria and yeast a lot more than other probiotic foods on the market e.g. yogurt. It is a drinkable yogurt consistency and tastes tart. I bought kefir cultures from the on-line health shop, which come in 5 sachets. Each sachet can make about 5 liters of kefir drink. Because my stomach doesn’t like milk that much, I made mine with soy milk. But it is up to you, you can use almond milk, oat milk, coconut milk, etc. 1. Add one sachet to 1L of soy milk in a glass jar. 2. Cover up and let it sit on your kitchen bench for 12-24 hours. Give a few shakes or stirs every 12 hours. 3. Once it’s thickened up and smells sour, store in the fridge and drink within a week. 4. You can use a cup of kefir to make another batch, up to 5 times. I couldn’t believe how simple it is to make my own kefir drink. You can flavour with some vanilla, fruits, sweetener like maple syrup or honey. 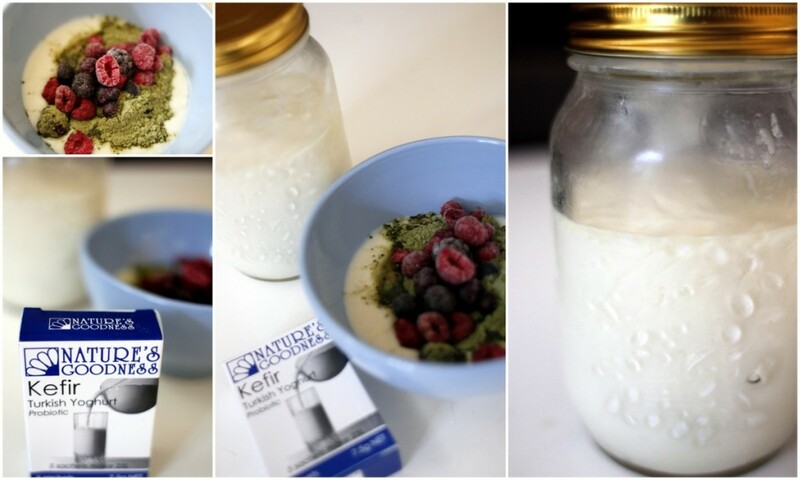 I try to have a cup of kefir every morning with my breakfast, which has helped me so much with my digestion. If you have digestive issues like gluten- and lactose- intolerance, I strongly recommend to give this a go. You will feel the difference.